Most people don’t like changes, regardless if it’s in their personal or professional life. The goal of the CM (Change Management) is to manage the changes to the organization, team or individuals in respects to their business processes, SOP (Standard Operating Procedure) or IT systems. 1. Change Assessment: This step is twofold and includes characterizing the current situation, and then assessing the required change in order to align the recipient with the new situation. This is basically the stage of putting together the plan for the CM. 2. Change Impacts: This step is done more or less in parallel with the previous step (Change Assessment), and its goal is to estimate how the organization will benefit from the change, who will be affected and how. This step should present the business justification of the change to the company’s management. 3. Stakeholder Engagement: Any change requires the full support and commitment of one or many key stakeholders of the organization. This steps’ goal is to get their full support for the change and make sure that they are kept in the loop regarding its progress. 4. Communication Plan: Keeping all those affected by the changes up to date regarding the change and its impact is crucial to its success. This step requires the CM team to plan how the changes will be communicated throughout the team/organization. 5. Change Readiness: In this step, the CM team assess whether the team/organization are ready to make the necessary changes. This is basically a go/no-go gate. 6. Role Mapping: In this step the CM team map out the users of the new system / process / procedure, and what they will be expected to do in their new roles. If any of the users require permissions to the new system, this step outlines them. 7. Writing Documents & SOP’s: This step documents all of the changes that were made to the organization, and also Training / KT (Knowledge Transfer): This step may be under the responsibility of a separate training team (depends on the organization). In this step, the CM team train the new users on how to operate the new system or use the new process. Change requests a.k.a CR’s are changes to the scope of work for projects after they have started. Typically, change requests are seen as a hindrance as they disrupt the project team would have started the work and will be working towards a goal. Depending on the change requests the project teams might have to alter their plans which may cause rework or wastage of some of the work done. Change is the only constant and that is true with projects. Seldom there are projects which don’t have change requests and which don't need Change Management Process. The change requests can pop-up any time and as a project manager, you need to have all the tools you need to handle the situation. 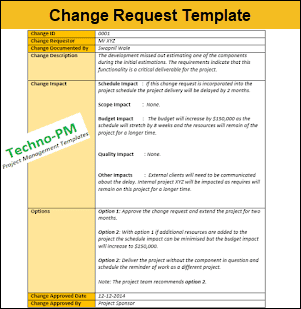 The change request template is one of the most effective tools when it comes to handling change requests. Using a Change request provides a consistent approach to looking at the changes. Using a form ensures that all the data required for making the decision is captured at one place thereby making sure that a decision will be made. Senior management or managers who make decisions on CRs will know where to find information to make the decision. Helps in maintaining a documentation trail which can be used in future for audit. Typically, in the software industry, they are used when there are major changes to the way in which project plan for the software being built is changed. Change requests can also be used when the system requirements change at a later stage or something was omitted from the initial set of requirements. CR form should be used when the changes requested may impact the project KPI in any way. If the change is small and can be observed then logging into the Change Request Log should be enough. One more common example is during the testing of the IT system there might be a major bug which will might a review of the design. The outcome of the review could be full overhaul of the design which will need a change request to be logged. Conduct a brief meeting with the SME or project team to understand details. You will need to know what the impact of the change is, how much is the effort and what options you have. After the meeting or catch-up you need to have a clear idea of how the change will impact – project schedule, scope, budget, quality, and any other impacts. Create a draft of the document and share it with a few experienced manager or SMEs to get feedback. Share with your manager to get his or her feedback. How to identify a scope change or change request? This is the most difficult task. Most of the times the project team members will be so focused on their individual tasks that they fail to identify scope changes. As a project manager, it is your responsibility to identify scope changes. To be able to identify scope changes the project manager should be aware of the details of the project deliverable. It also important the project manager participates in scrum meetings, project meetings, technical workshops etc as the scope changes can come from different sources. The changes could come as part of internal team discussions, senior management feedback and from the system users. Internal changes or changes which arise from team discussions could come as a result of design reviews, code reviews or team demos. Senior management can also provide feedback to make sure the deliverable is in line with the company's strategic goals. The system users may ask for changes after seeing a demo or prototype. 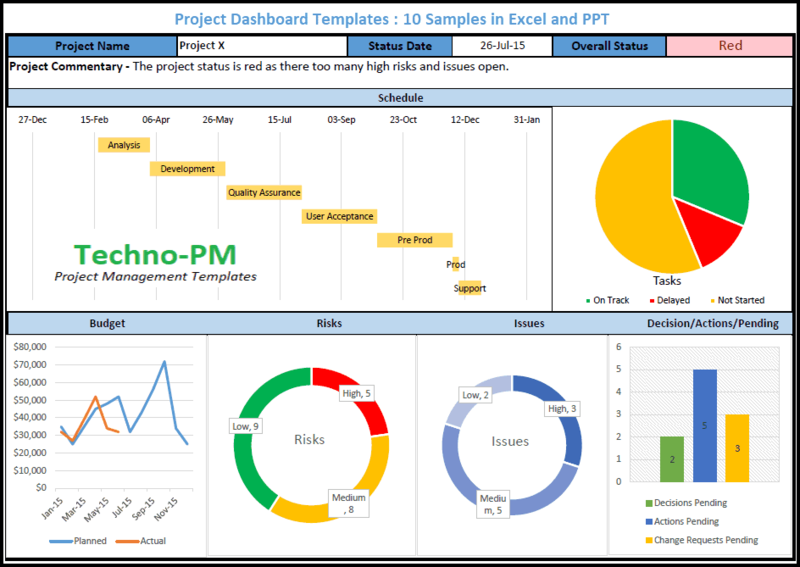 Most of the times the requester of the change is unaware of the impact of the change on the project schedule and this is where a change management process is useful. The change could be required or optional. All the stakeholders of the project should be aware of any changes to the project. In the next step, we will see how a project manager can handle a change request. 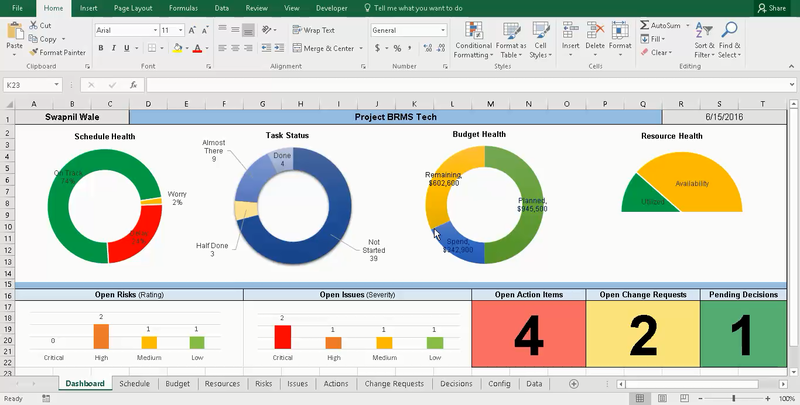 Change log or a change register is a document used in project management to capture all the changes that have been requested after the initial kick off – it is a vital part change management process. It is very common to get requests to make changes to software or scope during a normal project. It is important that a project manager track and ensure that all the changes are addressed as part of project change management. Everybody involved in the project should be aware of the changes requested and their current status. If changes are not managed properly then the projects are bound to fail. It is for a project manager to get influenced by one of the parties involved in the project who want a change in the project. Provides a structured way of capturing change requests which form part of good governance. Provides a clear audit trail as all the changes will be captured at one place with additional details like decision status and date. This is very helpful especially in long-running projects. As everything is in one place anyone can access the document which provides transparency. The changes log can be shared or reported as part of the project status report which helps in stakeholder management. Once you a list of change requests you can also easily prioritize. 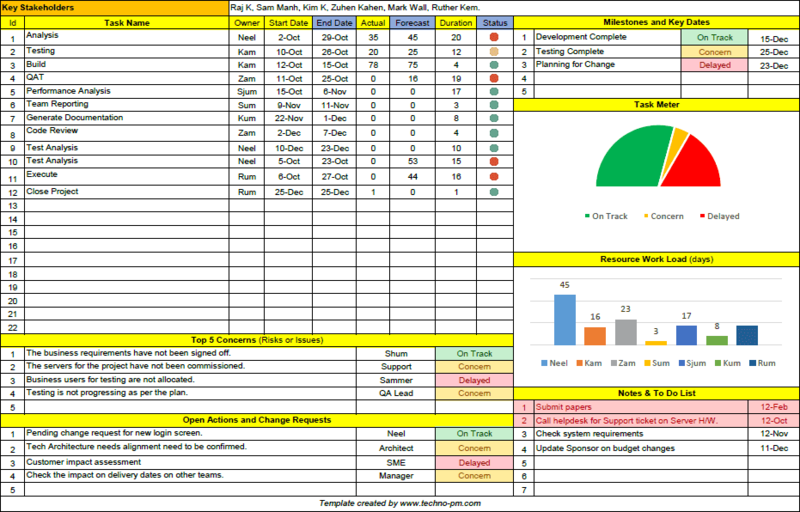 A change log should contain all the information required to track and manage change requests. Other than the basic information about the project like name and project manager name a change log should contain the following. Change ID – a unique incremental ID for each change request logged. It can be any if any format you want. Examples include – CR001, CHANGE001 or simply 001. It is important that this is unique as the change ID will be the referenced whenever the change request is discussed. Change Description – This is a simple description of the change request. This description should be short and simple. People should be able to understand what the change is about when this description is mentioned. Examples are “Additional Screen Option”, “Secure Email Configuration” etc. Requester – is the name of person or team who requested the change. Date raised – is the date when this change request was raised. Decision and decision date – decision can be either Approved, declined or on hold depending on the decision that was made for the change request. Decision date is the date when the decision was made. Comments – is a general field which can be used to enter comments. Any change, even the smallest one, has an effect on the employees and should be carried out with sensitivity. A small token is often a good idea to minimize the stress associated with changes. This can be a new piece of equipment (chair, desk, etc. ), a plant or thumb drive. A change should be treated like any other project and should have a high-level timeline, a detailed work plan, and risk matrix. If the company has a union, they should be considered a key stakeholder in the change management. Most people associate changes with the firing of employees. If none are planned, this should be made very clear at the start of the project. And always remember that you will face resistance when you are following the change management process because people want to get things done without going through the documentation or without making it public. As a project manager it is your responsibility to make sure that any decision regarding the changes is taken by appropriate people in the most transparent fashion.